DinerTown Detective Agency free game is one of more than 400 free Games you can download at Free Ride Games, DinerTown has fallen into chaos following a recent crime wave! Eager to investigate the unfortunate phenomenon, Bernie the Bookworm decides to order a Detective Kit he saw advertised in a magazine and transform himself in to a full blown detective. Together with his friend Flo (of Diner Dash fame), they set out to solve more than two dozen mysteries, and they need your help! Hunt for vital clues in major crime scenes and solve timed puzzles to help the enterprising duo nab the culprit behind every mischievous act. Don't let the simplistic names of some of the puzzles (like 'who's been partying like a rock star with the zoo animals?' and 'who stuck their finger in all the jelly donuts?') fool you though. They are actually quite challenging, especially with the time limited levels adding to the level of difficulty. 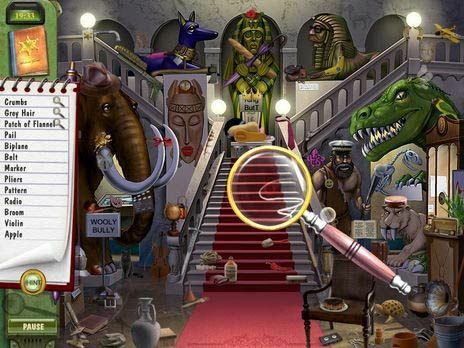 Overall, DinerTown Detective Agency is quite an addictive Hidden Object game that is guaranteed to keep you entertained for hours. Download DinerTown Detective Agency for FREE and enjoy: * 25 unique cases each with multiple puzzles to solve. * Explore 20 locations throughout DinerTown in your search for clues. * 4 new mini-games to help you solve the cases. * Only you can identify the culprit using the clues you find as evidence. * Investigate all the familiar DinerToons - you never know who might be a suspect. Free Ride Games is the only place where you can download over 300 top games for free, including Hidden Object games, Time Management games, Match Three games, Sports games, Puzzle games, Arcade games, Card games, Board games, Flash games, Fashion games, Food games, Online games, Word games and many more. We have hundreds of choices from the leading game publishers like iWin, PlayFirst, Sandlot Games, Mumbo Jumbo etc. Download DinerTown Detective Agency free game and play it now.